This is followed by the 33rd EDITION OF THE MONTREAL INTERNATIONAL JAM on 14 and 15 November 2015. Arborescence from Yves Candau on Vimeo. 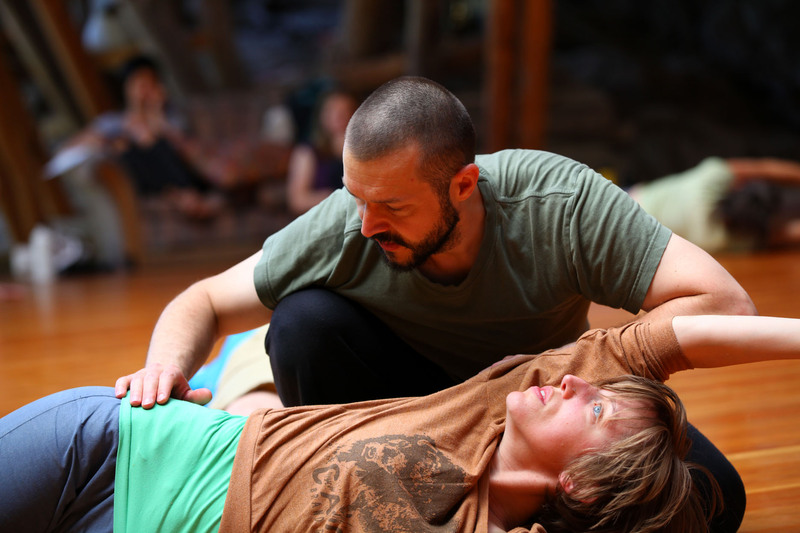 My teaching has been nourished by a number of past and present practices: Aikido, Vipassana meditation, and most importantly Steve Paxton‘s Material for the Spine and the Alexander Technique. As dancers we are privileged to experiences that are both wholistic and multi-layered. One could say that our dances take place simultaneously in the mind, in the body and in the world. We will use these complementary and interconnected points of view to explore and articulate the intricacy of our living moving beings. Internally we will develop our awareness, clarity of intention, and refine our use of the foundations of movement in the body: such as the structural support provided by the skeletal system, the connectivity of the fascia, or the flow of muscular tone that creates movement. Externally we will explore and strengthen specific movement patterns, such as the helixes manifested in walking, that can be expanded to take us in and out of the floor, and through space. We will aim to expand our perception and physical possibilities towards a spherical appreciation of space, where movement can take place in any direction. These points of view will integrate as we practice working both internally and externally, through overlapping cycles of attention, intention and action, creating a rich place from which to meet one another. There is for me a deepening of experience to be gained here, which supports my exhilaration of exploring movement and the joy of dancing with a partner, as a conscious as well as physical being. Yves Candau I have a background in science (MSc in applied mathematics and MSc in cognitive science), and am currently completing an interdisciplinary MFA at Simon Fraser University. I was working on a PhD in cognitive science when I discovered dance. Gradually my interest shifted from the abstract to a more embodied research, which I have been passionately pursuing ever since. I trained with several teachers in Paris, and deepened my practice of contact improvisation and improvisation studying in Europe and North America, in particular with Steve Paxton, Lisa Nelson and Daniel Lepkoff. I have been teaching Contact Improvisation since 2001, giving classes and workshops in France, Italy, Germany, Canada and the USA. As an interpreter I have worked with a number of independent choreographers in Toronto: Rebecca Todd, Eryn Dace Trudell, Malgorzata Nowacka, Newton Moraes, Holly Small, Kathleen Rea, and most frequently Peter Chin, for whom I have had the pleasure to dance over a span of 10 years and six different pieces. a solo piece at Saint Mark’s church in New York. This was part of an event Steve organized for Danspace Project’s Judson Now series. I am also an overtone singer and a teacher of the Alexander Technique.